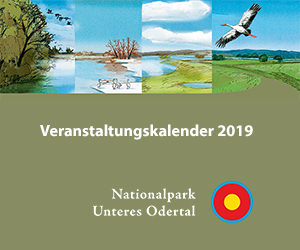 At 55% or 5,725 hectares, grassland is by far the most dominant kind of biotope in the National Park and is characteristic of the polder areas in the Lower Oder Valley. These are mainly periodically wet floodplain and fallow grasslands. The floodplain grassland alone covers 3,672 hectares, representing 35% of the total National Park area. Fallow grasslands were mapped at 972 hectares of the total area, which corresponds to an area percentage of 9.33%. The floodplain grassland of the Nasspolder is dominated mainly by reed species such as Reed Canary Grass (Phalaris arundinacea) and also partly by Reed Managrass (Glyceria maxima). In addition, there are species of floodplain grass such as the Marsh Foxtail (Alopecurus geniculata), Creeping Bent Grass (Agrostis stolonifera) and Creeping Cinquefoil (Potentilla reptans) as well as species of the meadows and pastures, including the Meadow Foxtail (Alopecurus pratensis), Rough Meadow-Grass (Poa trivialis) Ragged Robin (Lychnis flos-cuculi), Meadow Cat’s-Tail (Phleum pratense) and Common Rush (Juncus effusus). In dry polders, the species of reed beds retreat in favour of species of the meadows and pastures. Partially dominant here is the Meadow Foxtail; also commonly found is the Couch Grass (Elymus repens), in the transition to the fresh meadows you can also find the Tall Meadow Oat (Arrhenatherum elatius). The floodplain grassland also contains numerous characteristic species of the river valley meadow, such as the Queen Anne’s Lace (Cnidium dubium), British Yellowhead (Inula britannica), Great Burnet (Sanguisorba officinalis), Longleaf Speedwell (Pseudolysimachion longifolium), Mouse Garlic (Allium angulosum), Marsh Euphorbia (Euphorbia palustris) and Weidenblättrige Sumpf-Schafgarbe (Achillea salicifolia). For the fallow grasslands, in addition to species of reed beds such as the Common Reed (Phragmites australis), there are various characteristic species of sedges, like the Lesser Pond, Slender and Greater Pond Sedges (Carex acutiformis, C. acuta, C. riparia) and species of the perennial meadows such as the Purple Loosestrife (Lythrum salicaria), Yellow Loosestrife (Lysimachia vulgaris) and Marsh Woundwort (Stachys palustris). In the grassland, several types of habitats according to Appendix I of the Flora and Fauna Habitats Directive are sometimes found in large areas. In particular, the habitat type Brenndolden-Auenwiesen – Queen Anne’s Lace-Floodplain Meadow – (LRT 6440) is the most significant in the National Park. This is primarily widespread in polders A/B, 10 and 5/6. River valley meadows are sporadically mapped also in the Lunow-Stolper dry polder. With 72.5%, however, the most predominant part has either an unfavourable preservation condition or is mapped as a development area. A little more than a quarter of the area is rated with a good state of preservation but only 1.3% of the area has an excellent rating.